Inflatable Party Magic LLC features a quality dunk tank with built in safety features and a safety window so you can see participants at all times, even when they are dunked into the tank. This keeps all participants having fun and staying safe at the same time. Dunk tanks are only to be occupied by adults, but kids and teens can participate by throwing at target to try and dunk someone. Kids and teens under the age of 18 years old can't be dunked in the tank. Dunk tanks are a timeless classic carnival attraction and a guaranteed crowd pleaser. They provide hours of fun with a splash! 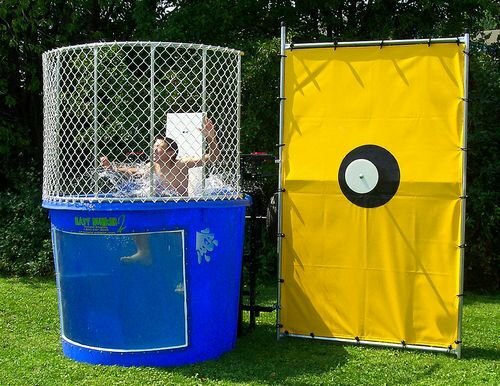 Dunk tanks give patrons the opportunity to soak their rivals, co-workers, bosses, or even friends. They are a Perfect addition to community festivals, corporate, school and church events. Everyone likes to try out their throwing arm and show what they have with the dunk tank. There is no better sense of accomplishment than to aim, throw, and dunk someone into the tank. It is even better if the person before you missed the target (at least it is for those of us that are competitive). Who doesn't want to take the opportunity to dunk someone and let the competition begin? We provide the dunk tank fun and you provide the water source and water hoses (you will need as many as it takes to get from your water source to where you want the dunk tank set). The dunk tank holds 500 gallons of water. Dunk Tank inside the tank Participants must be 18 years of age or older and no more than 250 lbs. Children and teens cannot be dunked in the tank. The dunk tank requires adult supervision at all times and must be drained if no one will be supervising. To book the dunk tank online, you simply click the dunk tank below and add to your cart then follow the directions. If you prefer to book over the phone, you can contact us at 817-800-8618 and we would be happy to assist you. Please do not hesitate to contact us to book or just ask questions. We love assisting our customers in any way we can.